An apple a day keeps the doctor away, or so the saying goes. If for no other reason, apples are a great addition to any smoothie but scientific research has also highlighted many health benefits. For example, a study has shown that in children with asthma, those who drink apple juice daily wheeze less than children who drink apple juice infrequently (about once per month or less). People who eat two apples a day could lower their cholesterol levels by as much as 16 percent. This benefit is due to the fact that pectin in apples lowers ‘bad’ cholesterol levels. Pectin also supplies galacturonic acid that may help in diabetes management as it temporarily lowers the body’s insulin requirement. Research has also suggested that quercetin from apples may help in prevention of Alzheimer’s disease by protecting brain cells from damage caused by free radicals. Here are two of my favourite smoothie recipes using apples. Additional apple juice as required to make the smoothie the right consistency for your taste. Place yogurt, apple juice from can of prunes into the smoothie maker first, then the apples, stoned prunes, ice cubes and finally the cinnamon, mint and lemon rind. 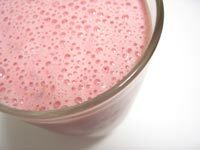 Blend until smoothie, if necessary using the pulse function on your blender and add additional apple juice if required. (Blueberries are very high in antioxidants and good for giving your immune system a boost). Place the chopped apple in the smoothie maker, followed by the milk and yoghourt, then all the other ingredients and blend until smooth as above. Both these recipes provide two good servings – enjoy!